I finished it. 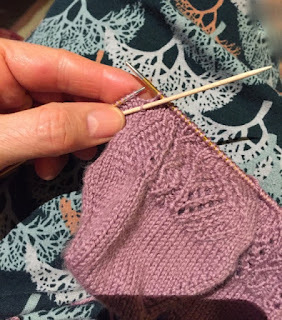 With a contrasting heel and toe and as mentioned in previous post, I added a few stitches before turning the heel to add a bit more depth in that area of the sock. I think it's better. I added just four stitches and I think next time I might add six as I don't like feeling tightness across the foot in that area. 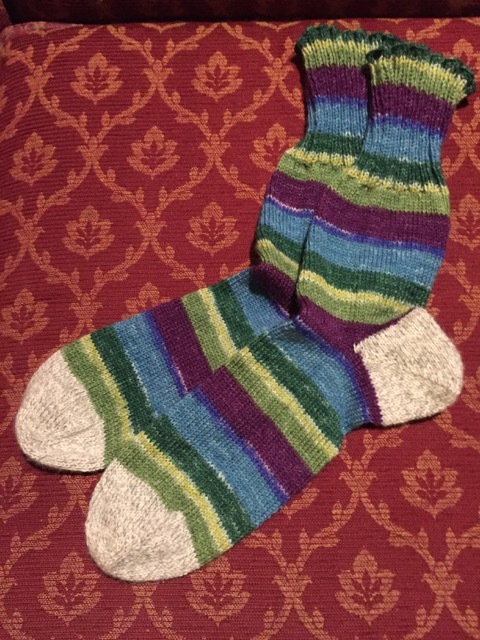 That's one reason I really like gussets in socks. 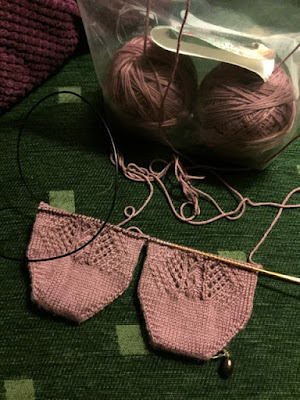 It's much slower going with all the one-stitch cabling going on but I think they'll look nice. I'm a big fan of cabling without a cable needle but one of the twists made with three stitches was a little hard to accomplish so I had to resort to a needle... or sorts! I couldn't find mine so I searched for an alternative. Turns out a toothpick (or cocktail stick) works great! Just the right size and enough grip so the stitches don't slide off it while you work the twisting. So there you go, if you're ever stuck without a cabling needle, reach for the cocktail sticks! Looks as though the dye hasn't penetrated properly? The socks are still great though. But the ones you're working on now really look like socks I'd want! I love the socks! I think the bit of white is intriguing, more like hand-dyed with flaws. I love the cocktail stick idea! The pink socks will be gorgeous! I like the white, it gives a bit of depth somehow. This next pair looks very interesting and your inventive use of cocktail sticks. I don't mind the white bits, at least is shows up in both socks.